"Breathing fresh life into bebop"
During the 1950s, Los Angeles – Dream Factory to the world – was a powerful magnet for jazz musicians. If they were white, they could earn significant studio bread, with ample time for leisure in a benign climate. Certainly, time sufficient to develop a new sound, West Coast Jazz, drawing inspiration from Miles Davis’s hyper-hip 1940s Birth Of The Cool outfit. Saxophonist Allison Neale was born in Seattle, Washington, an 1,100-mile crow-flight south to L.A. But she proudly claims her West Coast jazz heritage and, above all, the artistry and passion of her holy trinity of alto masters: Art Pepper, Bud Shank and Paul (“I want to sound like a dry martini”) Desmond. A chilly, murky south London evening was quickly erased by sounds that evoked palm trees, surf boards and crew cuts. Clearly, Allison has no crew cut, but her long straight hair doesn’t obstruct ears because she’d chosen her musical companions with taste and precision. 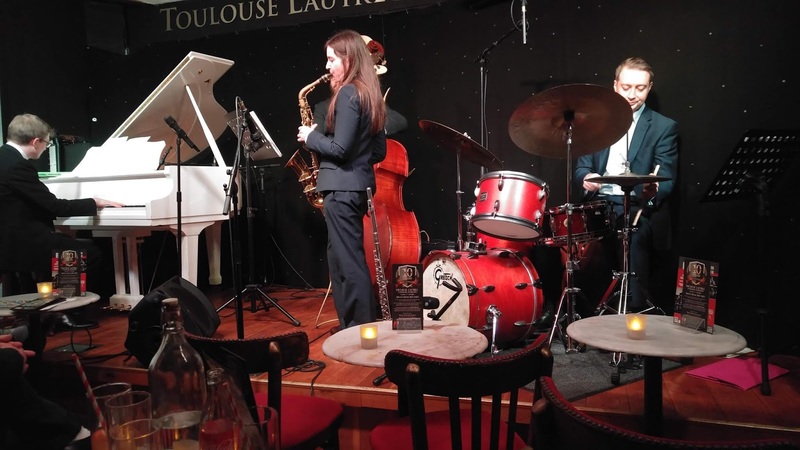 Piano star Alex Bryson is a Brit who’s been working in Manhattan; Dave Chamberlain is a bassist who matches perpetual enthusiasm with flawless intonation. And, on drums, bebop master Matt Fishwick swings awesomely. The group swung into a Peppery Holiday Flight and didn’t stop swinging all night. Then a sensuous version of Jimmy van Heusen’s Imagination, referencing Pepper’s celebrated meeting at Contemporary Records with Red Garland, Paul Chambers and Philly Jo Jones, Miles Davis’ world-beating rhythm section, then playing L.A. According to legend, Pepper, a monumental junkie freshly out of San Quentin, entered the studio in an unfamiliar state: strung-out, cold sober and unrehearsed. Of course, the resulting album is a masterpiece. After a Latin-tinged I Love You by Cole Porter, Allison switched to flute and, over Fishwick’s filigree brushwork, delivered Hank Jones’ Minor Contention sensitively, elegantly supported by Bryson, who wowed the audience. They wrapped the set with Dizzy Gillespie’s Tin Tin Deo (another nod to Pepper’s heroic encounter with the killer Rhythm Section) and Jubilation, Bob Cooper’s piece for Bud Shank. Set Two opened with intricate manoeuvres on Lullaby In Rhythm, Neale and Bryson producing swirling patterns in tight unison. Alex Bryson added extra dazzle to Bud Shank’s I Hear You Cried Last Night (Chamberlain and Fishwick, twin bastions of the beat, were on song all evening). Begin The Beguine invoked Cole Porter once more, Neale and Bryson competing (and succeeding) to create fresh twists on the 108 bar classic. Jimmy Dorsey’s tender ballad, I’m Glad There Is You, received gentle (but never sentimental) treatment with ravishing piano and an arco bass solo. Allison’s flute popped up for George Wallington’s serpentine Sweet Blanche, before she returned to alto for the closing Landscape, a post-bop piece by Pepper full of scorching invention. The thrilled audience appreciated every twist. Thank you, Allison and Nat Steele for breathing fresh life into bebop and organising another Bopfest triumph. P.S. The curtain-raising duo, pianist Gabriel Latchin and bassist Luke Steel, accompanied our unctuous cassoulet. They’re deserving of even wider encouragement: their lyrical set swung and was relished by the sophisticated diners.